With 100 test match appearances he was the most capped Welsh rugby union player until he was overtaken by Stephen Jones in September 2011. He is currently ranked 12th among international try scorers and is the second highest Wales try scorer behind Shane Williams. He also won 4 rugby league caps for Wales, scoring 3 tries. He played rugby union for Bridgend, Cardiff, the Celtic Warriors, Toulouse, Cardiff Blues and Wales as a fullback, wing or centre. In 2010 he moved to rugby league, playing for the Crusaders RL in the Super League, and for Wales. He retired from rugby in October 2011. Thomas came out as gay in December 2009. The following year he was voted the most influential gay person in the UK in the Independent on Sunday Pink List and received Stonewall’s Hero of the Year award. 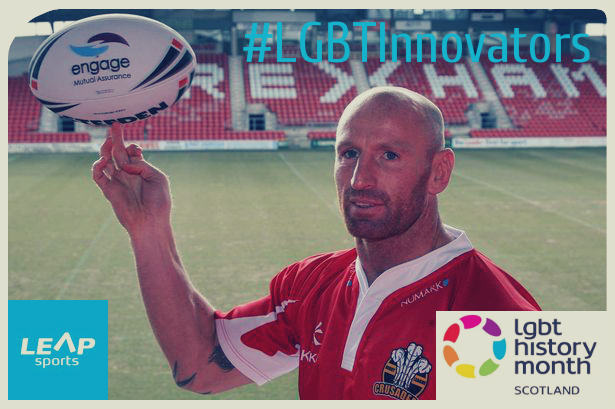 Thomas’ coming out made him the first openly gay professional rugby union player. In an interview with the BBC, Thomas talked about how he hoped that his coming out would mean that in the future, young gay rugby players would be able to come out and be accepted as a “talented gay rugby player”. Since coming out, Thomas has become a vocal supporter of the charity ChildLine, a telephone counselling service for children and young people. In an interview, Thomas commented, “I don’t know if my life is going to be easier because I’m out, but if it helps someone else, if it makes one young lad pick up the phone to ChildLine, then it will have been worth it”. Written on 4th February 2016.